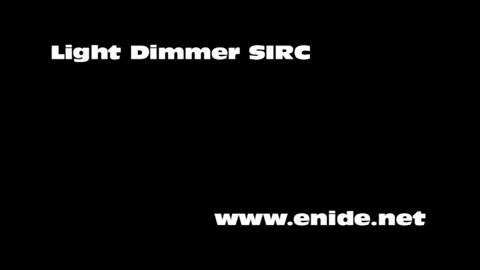 Light Dimmer with Infrared remote control | Enide! This is a light dimmer for incandescent light bulbs controlled by any Sony SIRC compatible remote controller. 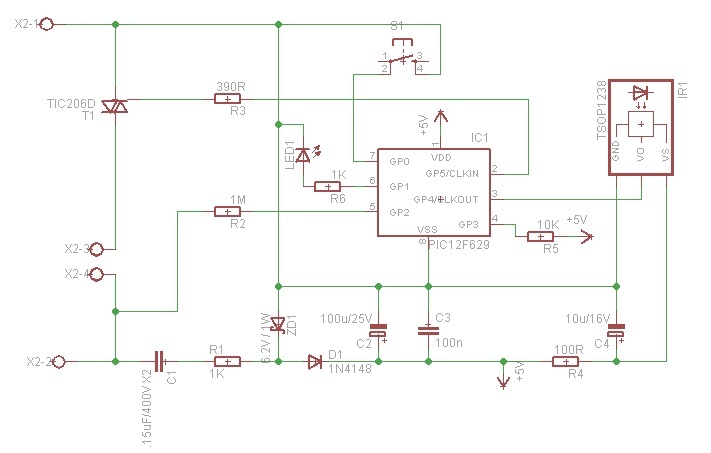 This circuit is an original idea of Ivica Novakovic  and more information can be found on his website. Its working principle is based on phase control were a triac is fired a short time after each half-cycle of the AC waveform. By carefully calculating these delays it's possible to adjust the intensity of the light bulb in constant steps . Since in most universal infrared remote controllers only the numeric buttons, program change and volume change buttons are standard, to increase compatibility across multiple brands of remote controllers, only these buttons are accepted by the dimmer software. It is desirable to have a preset intensity but it should be possible to temporarily change the light intensity without overriding the preset value. The software only stores a new preset intensity when the user turns the light off by pressing the power button or by pressing the Mute button to save it on demand without turning off the light. The dimmer should remember its power state if the utility power fails (or someone cuts the power). This enables the dimmer to coexist with a wall on/off switch and original wiring. In this scenario the dimmer is placed inside a light fixture and power is controlled by the on/off switch while the light intensity is controlled by remote control. It should be possible to select the intensity in 10% steps from the minimum 10% to the maximum 100%. 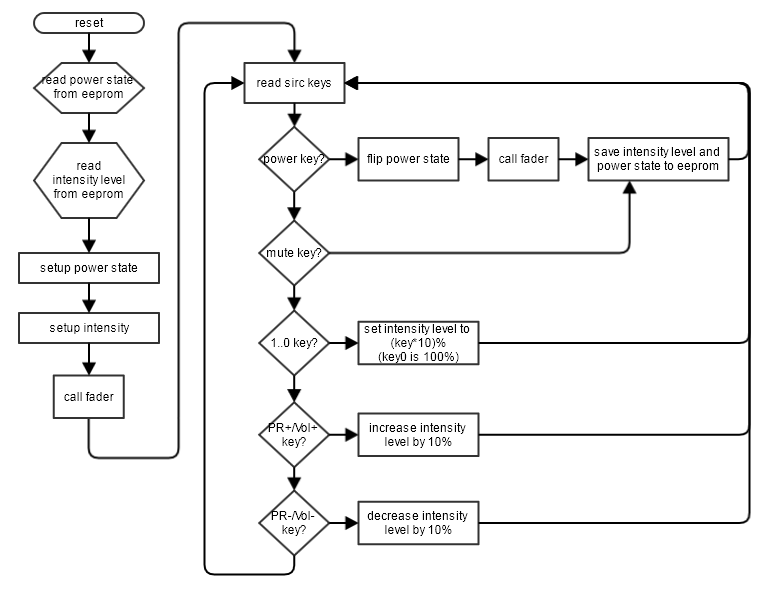 It should be possible to increment and decrement the intensity. 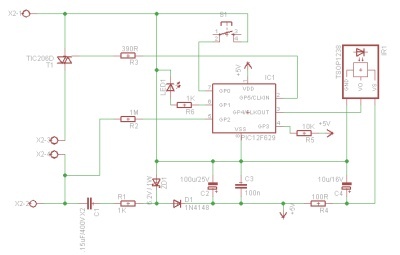 The schematic is similar to the original and contains an extra led to blink every time a valid command is received. The PCB is a lot bigger than the original one because I'm using through-hole components, PCB connectors with screws and placed most components horizontally. The software allows the selection of 10 different levels of intensity, selectable using keys 1..0, PR+ and PR- and VOL+ and VOL-. The Mute key saves the currently selected intensity as the power on preset. The Power key toggles the power on the light bulb and saves the preset value to the current selected intensity on power off. The power state is remembered across utility power losses so that the circuit can be used with an external switch that cuts power and still remember the last saved light intensity. 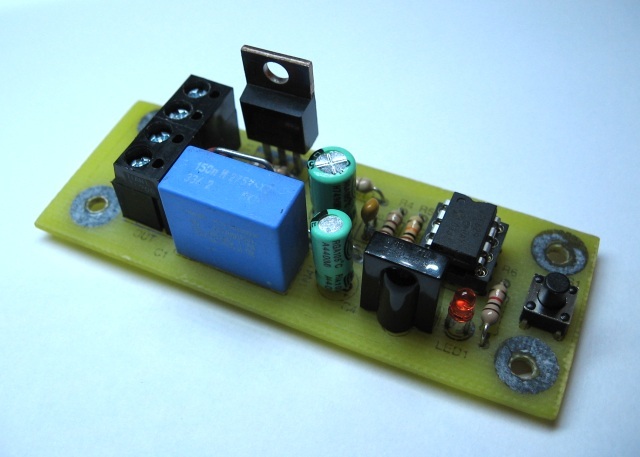 Warning: this circuit is connected directly to 230V and it might kill you if you are not careful. Both hardware and software assume the utility power is 230V/50Hz. Here's a picture of the board, ready to work. And finally a demonstration video.